Browse: Home / Welcome to Siena! 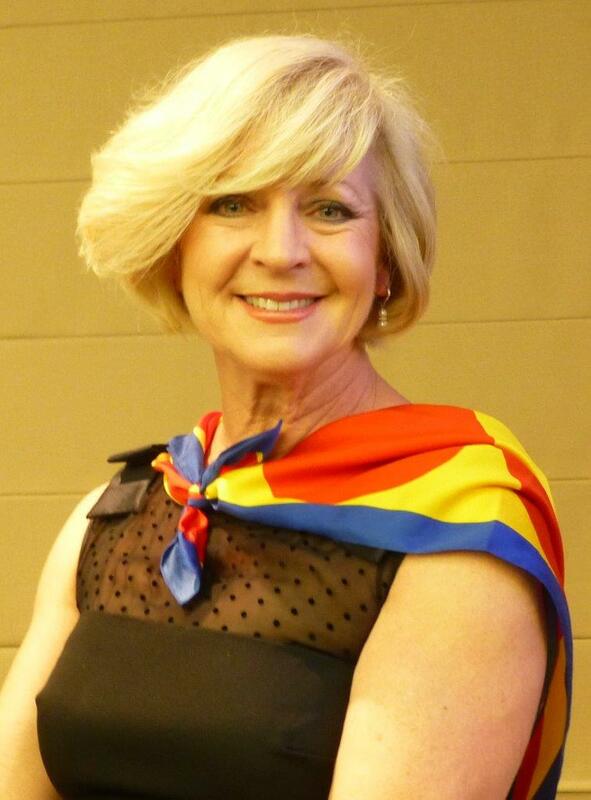 On 9 October some sixty people attended Lyndall Heddle’s comprehensive and fascinating presentation on this Tuscan city made famous by its Palio – a horse race run twice a year 2 July and 16 August) on the large square duly covered in sand for the occasion. Lyndall took us through the streets of Siena, dwelling on its Etruscan and Roman history; the devastation of the black plague in 1348; the take-over by Florence in 1555; its 17 contrade (districts); the foundation of the oldest surviving bank in Italy – the Monte dei Paschi di Siena; its wine bars (enoteche), its restaurants and good food stores as well as tea rooms; its musical strength (there is a Jazz University for advanced musical training); its fortress where they now hold open-air cinema; its churches with particular reference to the 1266 Chiesa di S. Domenico and the famous Romanesque-Gothic Duomo (built between the 13th and 14th century) which features striped marble pillars and inlaid marble pavements; its fountains and medieval aqueducts; and its art. Lyndall dwelt on Il Campo – the seashell-shaped large piazza on which the race is run. Built on a downward slope, it is split into nine sections. 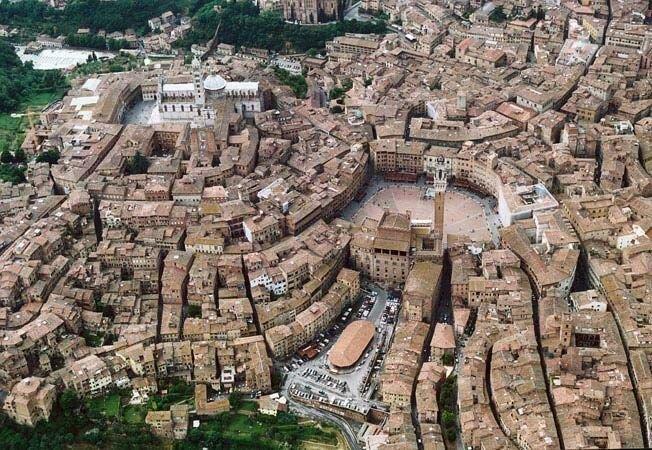 One of its imposing buildings is Siena’s town hall and it features an 88 metre-high tower. The city’s religious angle was well covered, for instance Lyndall showed us the (rather gruesome) mummified head of St Catherine of Siena on display in the Basilica di San Domenico. Catherine, a theologian, had received the stigmata in 1375 and had worked for the unity of the church. Lyndall stressed the importance of the contrada in the life of the Sienese: for the locals, the first allegiance is to the contrada, then to Siena and finally to Italy. Each contrada has its own costumes and banners, holds community dinners – and hates other contrade especially those that have won the most horse races. The contrada performs the role of a mutual aid society; the supportive environment limits the amount of crime in its area; and it has the important task of raising funds for participation in the Palio. At each race, only ten contrade can take part. Bribery and corruption are rife – some of the jockeys (fantini) of other contrade are paid to lose the race. (Note that the jockeys are not necessarily drawn from the contrade). 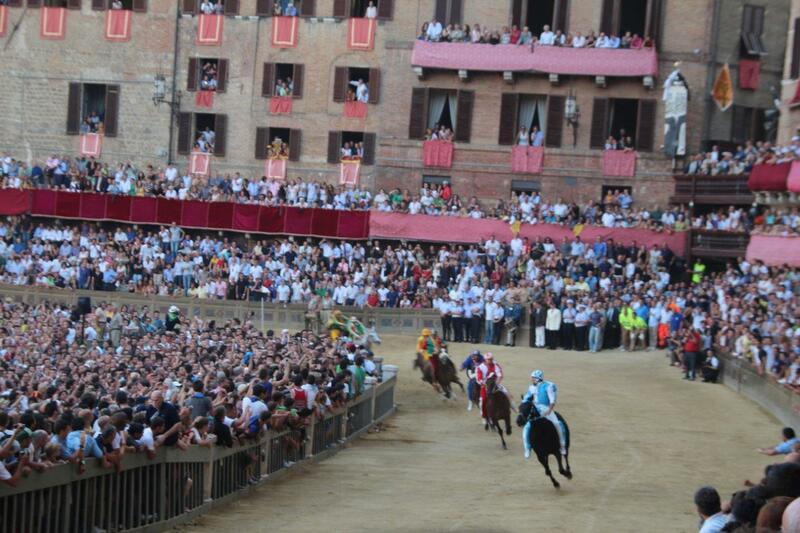 Paliofestivities commence with a mass celebrated for the jockeys and then priests bless the horses. The piazza is festooned; the tension and excitement are palpable as the procession enters the piazza. 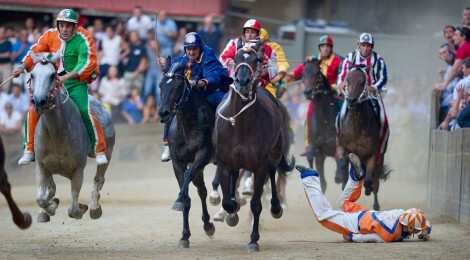 Then the race is run – and it’s all over in less than three minutes during which the horses go around the piazza three times. Post-race celebrations last well into the night. Lyndall showed us many photos of her enjoying life in Siena in the same way as locals do – particularly with good food, wine, culture and music. She also told us that the ANU has links with the University of Siena which happens to be the first publicly-funded university in Italy (it was funded by the city council). There are now 20,000 university students in town.